If you have a good credit score, part of that means you’re always paying your credit card bills on time. For people that do pay their bills on time, it can be difficult to imagine how credit card companies ever make money and how much money they could possibly be making. 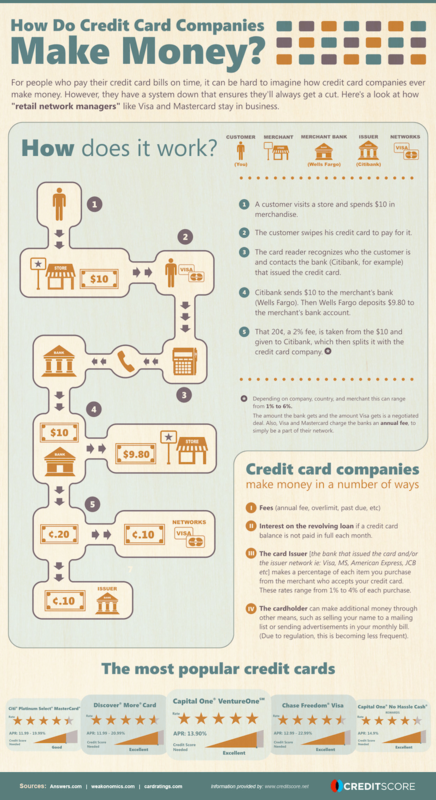 Here’s a look at how credit works and how these companies make their dough. Interesting point on how credit cards make their money if everyone pays their credit cards off on time. When you add the fact that many credit card companies offer a percentage of cash back to their customers, you really wonder how they can do it. Unfortunately there are a lot of people out there paying a lot of interest on their high balances, otherwise credit card companies wouldn’t be able to offer these generous rewards programs. Interesting that Capital One is the most popular credit card. I wouldn’t have expected that. Ya know how they do it? From people like me! Was that intended as a boast? Because it actually sounds more like you can’t trust yourself to handle a credit card. Too bad because when used responsibly they offer a great deal of convenience and at no cost. They should be teaching things like this in high school. Only a small percentage of schools teach finance and it is one of the most important things to know. I had no idea how stocks, mutual funds, bonds, etc.. even worked when I got out of HS. That’s what college is for. Or just doing your own reaearch adn reading books that they require in college. If you don’t use a credit card, you are actually getting screwed now that so many people do. Think merchants don’t include the credit card fee (for rewards and cost) in? Responsible people reap lots of benefits from credit cards – I get $50 back every 2-3 months (5% on gas, groceries, and pharmacy, 1% everything else). Or I could opt for gift certificates, flights, etc. The ones that pay cash (aka you) are the ones not reaping the benefits you’re already paying for. I run an e-commerce business. Depending on the type of credit card used (Visa, MC, Amex etc.) and even the specific flavor of one of those cards (‘regular’ amex vs. amex diamond or whatever) we can pay anywhere from 2.5% to 4% of each transaction in fees! Think about that for a second…it really adds up. Typically gross margins (the price the customer pays less the cost for the merchant to acquire and sell the merchandise) on products sold at retail are around 40%. If we have to pay 4% of the top line (the price you as the customer pays for something) to the credit card companies, then that represents 10% of profits! Merchant rates in other countries are a fraction of what we charge here…it’s a serious screw job in this country. So, every time you wonder why something you’re buying costs so much, just remember that the merchant you’re buying from has to pad the pockets of American Express and your card-issuing banks AS WELL AS buy airline tickets for most of the people using ‘reward’ credit cards these days. I agree with @Talktome that “they” should be teaching this stuff in high school. You know when they start having kids carry around a doll to teach them about what it’s like to have a baby, they ought to do the same thing with credit, bills, saving, investing, etc. Start when their 15 and have them do all the financial stuff until they graduate, checking in with a financial advisor every 6 months. @Charles: I say this with the zeal of a new convert, but how are credit card fees any different than electricity charges or a merchant’s water bill when it comes to calculating the cost of a product? And if 4% is so onerous, why pay it? Plenty of businesses don’t take American Express. Great stuff! I had no idea that this is how things were. This was very eye-opening. Yeah, that’s how they do it. It is better to stay below half the credit line and pay your debt faster or you will lose your hard earn money. Great stuff. I found you from digg too 🙂 nice! It is always better to handle all the credit card transactions with complete care. This will ensure financial convenience for your future. All you’re saying is that credit card users help to boost and complete credit companies hegemony and power. You are in fact helping them improve their ways of making money off us all, without some people even buying their products. You still pay more than you would if everyone used cash. Just because you get a small portion back you feel good about it, and for some reason think it’s reasonable to have a small gloat at those who are paying extra for literally nothing. So,how about merchant bank(Weels Fargo)? They don’t get anything income from the transaction.